J.O. 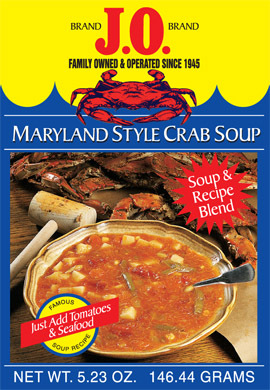 Maryland Style Crab Soup in just 30 minutes. It's easy to prepare… just add tomatoes and seafood. A rich blend of spices, vegetables, and barley that brings the flavor of the Chesapeake Bay right into your kitchen. Restaurant quality flavor! Each box makes approximately 10 (1 cup) servings. 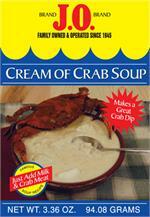 A versatile product offering a high quality cream of crab soup or a tasty hot crab dip! IT WAS JUST GREAT. I THOUGHT I WAS AT THE SHORE. We were on a trip to the DC area and drove up to Baltimore's Inner Harbor. While shopping among the little shops we came upon this soup mix. The price was worth the risk, so we decided to give it a try. We tried it last night, using canned crab lump crab meat. It was very good and I'm sure would have been better with fresh cooked crab. Unfortunately, fresh blue crabs aren't easy to find here in the DFW area and when you do, they are expensive. We will definitely be keeping this soup starter in the pantry from now on. My dad stopped in his tractor trailer at the JO spice co. and brought all kinds of stuff home from crab seasoning to this crab soup ,that we made tonight.It is awesome!! If you think that reasturant crab soup is good,you have to make this,its super good. Dads driving back south next week and moms got a list of things to pick up at there JO Spice store.